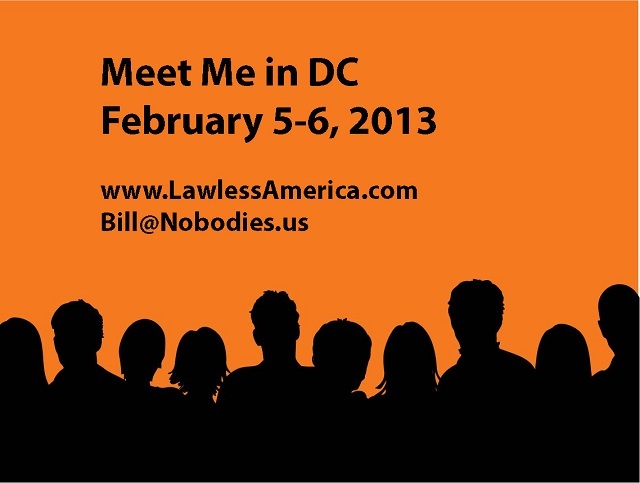 Watch the Nobodies become Somebodies at Meet Me in DC . 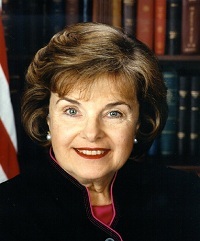 Senators like Diane Feinstein are responding by setting appointments with the Lawless America "Nobodies." It's going to be a very busy time. Here's a general update. If you are attending and have appointments with members of Congress, please email nobodies@att,net so we can give you priority on obtaining the packet to be presented. Otherwise, it will be first-come, first-served. PLEASE tune in to the Lawless America TalkShoe Show on Sunday from 10 pm – midnight Eastern Time. We will answer ALL questions about the event, and we will be providing training on what to do, not do, say, not say, etc. Click here for information on the show, how to call in, etc. MEET ME IN DC: THIS IS WHERE YOU ARE TO BE: Crowne Plaza National Airport Hotel, 1480 Crystal Drive, Arlington, VA 22202, www.cpnationalairport.com, 703-416-1600. Registration and general hanging out begins at noon on February 4. We need volunteers for various tasks, so if you can give us some time, reply to me only, and let me know what days and hours you could help at a specific task. Jobs include Registration Desk, Movie Listing Page Desk, webcaster assistant to help stream the events online live, still photographer, and videographers. We will start setting up the Arlington Ballroom at the Crowne Plaza National Airport Hotel at noon on Monday, so we can use all the hands we can get. Come to the Crowne Plaza National Airport Hotel, 1480 Crystal Drive, Arlington, VA 22202, www.cpnationalairport.com, 703-416-1600. Registration and general hanging out begins at noon on February 4. Registration then runs until midnight on the 4th, reopens at 8 am on the 5th and is open until 5 pm, opening again from 8 am to 5 pm on the 6th. You must come and register to pick up your packet to take to your members of Congress, or to get the information to coordinate with others from your state. Please fill out and sign the attached Release Form. This will cover us for all filming, photography, and audio recording, but this also serves as part of our Registration Form. Also fill out the attached Registration Form. Present both of these when you arrive at the Registration Desk in the foyer outside the Arlington Ballroom at the Crowne Plaza National Airport Hotel in Arlington, Virginia. We will use this to organize those from the same state, and this is what we will use to schedule filming. Please note that we will not be doing one-hour interviews in DC due to time limitations. Also attached is an invitation that you can print and give to the people with whom you meet on Capitol Hill. When you register, you will be given a name badge to wear and a special identity ribbon – black with the yellow road stripe (like the Lawless America logo). If you can donate $10, 420, or more, the Registration Desk will have a receipt for your tax return. When you register, the Registration Team will have a chart showing the various volunteer jobs that we need to have covered. If you can volunteer to fill some time slots, please let the folks there know. The next table is Movie Listing Page Help. Stop here if you need some help adding information to your Movie Listing Page. Then go in the Ballroom and mingle. There will be 20 tables, each with a bright yellow sign specifying a type of corruption. Find a table of interest to you. On February 5, the shuttle bus will run continuously starting with an 8 am departure from the Crowne Plaza. I recommend that you plan to be there two hours early to catch the next available departure. You do not want to be late. You do not have to use the shuttle bus; we are providing it as a convenience. Registration: Noon to midnight, Crowne Plaza National Airport Hotel. Filming: 4 pm to midnight, Crowne Plaza National Airport Hotel. Informal Get-together: 7 pm, Crowne Plaza National Airport Hotel. Registration: 8 am to 5 pm, Crowne Plaza National Airport Hotel. Shuttle Bus Service to Capitol Hill: 8 am to 6 pm, from Crowne Plaza National Airport Hotel. You don't want to be late for your appointment, so to be safe, we recommend that you be at the Crowne Plaza two hours before your appointment if you plan to ride our shuttle bus. Filming: 8 am to midnight, Crowne Plaza National Airport Hotel. Roundtable Discussions: 8 am to midnight. The Arlington Ballroom at the Crowne Plaza will be open all day and night with tables for each type of corruption so you can return to the hotel after meeting with your Congressmen to share experiences and ideas with those battling the same corruption as you. Breakfast: 7:30 - 9:30 am, The Lawless Changing America Conference will sponsor a Breakfast. 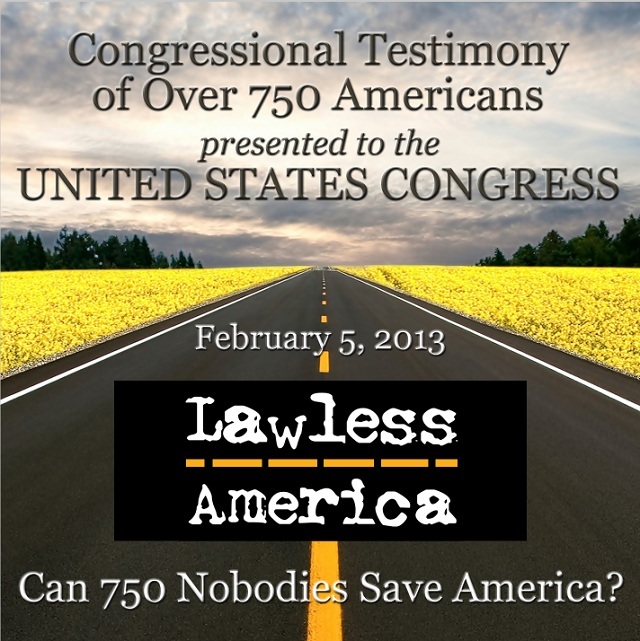 Lawless Changing America Conference: 2:00 to 6:30 pm. 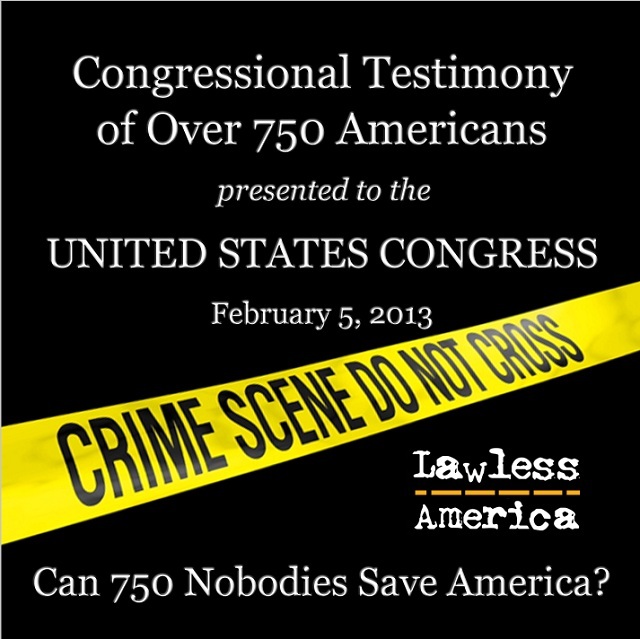 The Lawless Changing America Conference will present speakers at the Capitol in one of the House meeting rooms. Listen to speakers from around the country share their experience, strength and hope for American legal system renewal and how to take the nation to the next level of change. Cannon Office Building, Room 441. Registration: 8 am to 5 pm, Crowne Plaza National Airport Hotel. This is the place to be to meet informally with fellow Nobodies. Roundtable Discussions: 8 am to 2 pm. The Arlington Ballroom at the Crowne Plaza will be open all day and night with tables for each type of corruption so you can return to the hotel after meeting with your Congressmen to share experiences and ideas with those battling the same corruption as you. Private Congressional Meeting: 11 am to noon. A small group of Lawless America representatives will speak with Congressional representatives at the Rayburn Office Building, Room 2103. Lawless America LIVE: 2 pm to 5 pm, Arlington Ballroom - Crowne Plaza National Airport Hotel. We will conduct a Phil Donahue-style event in which we will deliver our presentation from the audience seats from a wireless microphone that I pass around to the appropriate people for the topic at hand. Lawless America at the Capitol: 5:30 pm to 8:30 pm, we will speak inside the Capitol at the Capitol Visitor Center North and South Theaters. There are approximately 60 speakers at five minutes each. If you want to join The Revolutionary Party, please bring a penny. As RSVP's continue to come in, I realize that we have a very real problem in that the hotel ballroom only holds 290 people. It now appears that we will have far more. Please understand that I always felt 200 was a realistic expectation based upon the solid RSVP's we had as of a month ago. So, we just do the best we can with what we have. We have 500 capacity in the Capitol theaters the night of the 6th. So, I suggest that you be early for the 2-5 pm event in the Ballroom on the 6th and/or the 5:30-8:30 pm event at the Capitol on the 6th. There is nothing quite as impressive as a packed house. Looks like we will have one or two or three.... Should we reach the room capacity, if you have an iPad, you might want to bring it as you could catch the webcast from somewhere in the hotel. If any of you need to speak with me, call me at 770-578-1094 between noon and 6 pm Eastern Time on Saturday or 10 am to 2 pm on Sunday. Allie is preparing a hand out flyer that will be available at the Registration Desk in the foyer just outside the Arlington Ballroom at the Crowne Plaza National Airport Hotel. It will detail the itinerary with the whens/wheres for folks, like a paper program list at a school concert. Nothing fancy…just the poop. We are a no budget operation! Speaking of no budget. Please make a small donation to help us cover the costs. Please donate $10 to $20 to cover the costs of the Ballroom, policeman, DVD’s, AV equipment, shuttle bus, and assorted other costs. $6,000 at least. ALASKA, MISSISSIPPI, NEW MEXICO, SOUTH CAROLINA, VERMONT, WEST VIRGINIA, WISCONSIN, AND WYOMING ARE NEEDED. We know we have folks coming from the other 42 states and DC. These are the only states (8) that we .are unsure about. It would be fabulous to have someone from every state, so let me know if you are coming from one of these states. Time to at least start thinking about packing. If you have a laptop and can bring it to help a bit, please do. If you have a video camera and can bring it and help do a little recording for us, please... do. It will be cold at night, so you should bring a coat (low about 32-degrees). Casual on Monday the 4th and after hours. We recommend business dress on the 5th and 6th when we are meeting with Congressy people. The following people are hereby confirmed to speak in the Capitol Visitor Center Theater North between 6:30 and 8:30 pm on February 6, 2013: Allie Lorraine Overstreet, Jan Smith, Kenneth Paschal, Margaret Motheral, Florence Patton, Deb Justice Young, Mary Bagnaschi, Gwendolyn Shavers, Clara Halper, Joanie Young, Monique Lukens, Ed Mashek, Zed McLarnon, Bill Windsor, MaryAnn Lubas, Diane Wilson, Nova-Lee Graber, Robert Sarhan, Aliana Brodmann W. von Richtofen, Angela Woodhull, Angela Ehlers, Michael Hense, Marlena Fearing, Charles J. Stecker, Jr. The following people are confirmed to speak in the Capitol Visitor Center Theater South betweenn 6:30 and 8:30 pm on February 6, 2013: John Lobianco, Michael Hense, Angela Pittman Robinson, Randall Townsend, Betsy George, Serena Hendrickson, Evelyn Case, Sandy Fonzo, Cheryl Kennedy, Kelly Holland Bingaman, Jim Singer, Mist Stilipec, David Collins, Debbie Tucker-Williams, Kelly Kenyon, Kathy Watson, Christopher Mackney, Sharon Kramer, Sheila Lucas-George, Matthew Taylor. Each speaker is limited to 5 minutes, and speakers will be in this order. We have the theaters at 5:30 pm, so we may plug additional speakers into the earlier slots. The forecast for next week is high in mid 40's, lows about 32, with a chance of rain each day. So, bring a coat and an umbrella. We will have a shuttle bus from 8 am to 6 pm on February 5 only. This means you have to pay your own way to the Capitol on the 6th. Plan to be at the hotel two hours prior to your first Congressional appointment to be safe. You may also use public transportation or private cars to get to Capitol Hill. We do plan to webcast LIVE the events at the Crowne Plaza. NOTE: I will continue to update www.LawlessAmerica.com with the most up-to-date information. Listen to speakers from around the country share their experience, strength and hope for American legal system renewal and how to take the nation to the next level of change.